I read that George Lucas' vision for Episode VII was very different from the movie that's been breaking records ever since its December 18th release--and that he's not at all happy with Disney's version. I don't know if that's true; I don't know if his version would have been as popular as The Force Awakens. But the suggestion that he wanted to go with all new characters, "no retro," makes me think I couldn't have liked it as much as I like J.J. Abrams' vision for the franchise. 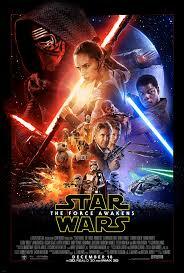 I'm glad that Han Solo, Leia Organa and Luke Skywalker returned to maintain the continuity of the franchise. I like knowing what happened to them after the credits began to roll on Return of the Jedi. I love that the new characters are connected to the old ones. The writing is far superior to the original movies, and the special effects take a back seat to character and action. The Force Awakens borrows heavily from the plot points of the original. There's a new and (unfortunately for the Resistance--formerly known as the Rebel Alliance) improved Death Star, now known as the Starkiller Base. (Clever--George Lucas had named Luke Skywalker Luke Starkiller in an early draft of A New Hope, I hear.) The Galactic Empire is now the First Order. There's even a Darth Vader wannabe--not a menacing Sith apprentice like Darth Maul in The Phantom Menace, but an immature, whiny brat calling himself Kylo Ren (Adam Driver), leader of the Knights of Ren. He's set out to "finish" what Darth Vader started, but as he's told quite bluntly in one scene, he'll never measure up to Lord Vader. Even if he does have conversations with Vader's burned out helmet. Yes, I know Anakin Skywalker was also a whiny brat. So, to a degree, was Luke Skywalker--whiny, but not a brat. But couldn't whininess skip a generation or two? It would be a refreshing change. It would also make Kylo Ren a more convincing bad guy. Especially given his lineage, which is revealed early in the movie. This film is a perfect balance of the old and the new, character-wise. There's a hotshot pilot named Poe Dameron (Oscar Issac) and a young scavenger, Rey (Daisy Ridley) who has powers she can't understand--yet. Abandoned on Jakku as a child, she refuses to leave, certain her parents will return for her someday. There's also a Stormtrooper who was taken from his family at an early age by the First Order and trained to serve without question. He doesn't have a name, only a number--until an attack of conscience leads him to free a captured Poe Dameron. 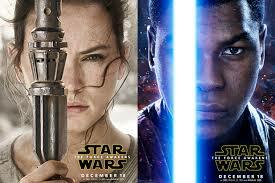 Together, they escape and Poe refuses to address him by a number, dubbing him "Finn" (John Boyega). Separated in the crash of their hijacked TIE fighter, Finn encounters Rey--and the Millennium Falcon, abandoned in a junkyard. As they attempt to escape the planet Jakku (which looks an awful lot like Anakin Skywalker's home planet, Tattooine), they're captured--by someone who's been searching for the Falcon for a long time. Harrison Ford and Carrie Fisher, as Han Solo and Princess Leia--now General Organa--have both aged well, but play their characters as battle-weary and forlorn, having dealt with a lot, good and bad, in the decades since we last saw them. Leia is searching for her brother, Luke, believing only he can restore balance to the Force and help defeat the First Order. She's also looking for the child she lost, the only child born of her union with Han. Standing in for Emperor Palpatine is a character called Snoke (Andy Serkis), who only appears as a hologram. That's one ugly dude--he makes Palpatine look almost cute. And while R2-D2 and C3PO do appear in the movie, the droid spotlight is now on the plucky little BB8, a rotating droid who carries the last piece to a puzzle both the Resistance and the First Order want: a map to the location of Jedi Master Luke Skywalker, who went into a self-imposed exile after one of his students was lost to the Dark Side and...well, if you want to know the rest, you'll have to see the movie. I've found most people tend to get nasty when faced with spoilers! As ruthless as Vader was, he was always in control. When one goes through life with the name Snoke, turning evil is inevitable. I wonder how many times he got stuffed into his locker, his head stuck in a toilet, or how many wedgies he got? I think you just hit on exactly why he turned evil. It would certainly make me lean toward the Dark Side! I am going with Daughter and Son on Monday to see this. I am very excited. 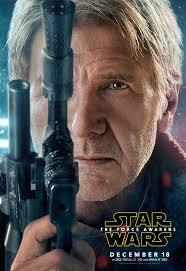 Unlike what George Lucas said I was very upset at what Harrison Ford said about his character. I do not want to say much as it is a spoiler. But all I can say is what a huge snot. I always enjoyed Hans Solo character. Now Ford has made me dislike him as a person. Talk about biting the hand that feeds you. I can actually see his point. I like the character, but sometimes characters have to be killed off, either because their storyline has plateaued, or to move the plot along for other characters. Ford said he thought Han should have been killed off in The Empire Strikes Back. I understand about moving along the storyline but he say some pretty awful things about his character. I am not sure what goes on between actor and director but I though he did grow up somewhat but that was the charm. I don't mind his death (sob) but his distain for his character really came out in the interview. Actors, like authors, have characters they love and characters they can't wait to be rid of. Ford's not the only actor I've heard badmouthing the dialogue and characterization of the first six Star Wars movies. I wonder if he agreed to appear one more time because he wants Disney to greenlight another Indiana Jones movie. He's done a lot of characters I love, and Indy will always be my favorite! I haven't seen any of the movies since the first ones. But good review, Norma. Thanks, Lorelei...and happy new year! Yeah, I heard Lucas was whining about selling off his 'children' but that's the way it goes! I don't think anyone can be as menacing as Darth Vader. Too much for anyone else to live up to! Yeah...he had to know when he sold the farm to Disney, they might want to make changes. The odds were against selling everything and still getting what he wanted from the scripts, etc. True. Vader's one of a kind! Excellent review Norma I particularly enjoyed the 'whininess' perhaps skipping a generation :) I confess I haven't seen any of the Star Wars movies, I know right.. quelle horreur :) Aimee on the other hand.. but I was watching 'Attack of the Clones' the other night with my young great-nephew, I'm not sure who was the most confused :)I do agree with Harrison Ford, eventually some characters have to die, c'est la vie! I think he (Ford) was simply stating that the character, no matter how popular, had outlived his usefulness to the plot. Since I was bored with the first one made decades ago, and tried enjoying the second one to no avail, I gave up on Darth, Hans and Princess Leia. Your review sounds amazing--if I had a clue what was going on. Tattooine? Lol Happy New Year! I didn't actually see the first two films in the theaters. The first one I saw was Return of the Jedi. Collin was four years old and, after seeing E.T. multiple times, wanted to see more movies (unlike most kids that age, he was mesmerized by what was happening onscreen). I took him out to lunch and to the theater, and all was going well until that scene early in the movie, the scene I'll never forget, where Luke Skywalker and his friends were about to get pushed into a pit that was home to a monster that would eat them. Luke saluted, did a flip on the plank, and caught his lightsaber, shot out to him by R2-D2. Great review, Norma! Wish I'd read it before I saw the movie. I did enjoy it, but I liked the earlier ones better. Thanks, Aimee! From what your mom has told me, you and I like most of the same movies. I confess, I didn't see it and had no interest, either.